Why should I study in Costa Rica? A very important thing about Costa Rica it is that is the only country in Latin America that does not have an army, air force nor marine corps. People: Costa Ricans, also known as “Ticos”, have a high literacy rate. Women constitute nearly 50% of the work force, and there is a large, working middle class; the gross disparity between rich and poor that you see in other Central American countries is not found here. Food: Rice and beans are the basis of Costa Rican meals. At breakfast, they are called gallo pinto and come with eggs. At lunch or dinner rice and beans go by the name casado (which also means ”married”). A casado usually comes with a cabbage-and-tomato salad, fried plantains ( a type of banana), and a meat dish of some sort. Health: (Vaccinations), No vaccinations are required for a visit to Costa Rica, unless you are coming from an area where yellow fever exists. Climate: Costa Rica is a tropical country and has distinct wet and dry seasons. However, some regions are rainy all year and others are very dry and sunny for most of the year. Temperatures vary primarily with elevation, not with season. On the coasts it is hot all year, while up in the mountains, it can be cool at night any time of year. In the highest elevations frost is common. Why should I study at Rancho de Español? Rancho de Español Language School is your school in Costa Rica. Our goal is to provide our students with an invaluable learning experience as well as cultural experience. Immersion is the best way to learn the Spanish as a second language. Here, we have the staff and the experience to help you progress quickly and enjoyably in your study of Spanish. We offer Intensive and Regular Immersion Spanish language courses, Spanish Programs for Kids and teenagers, Medical Spanish Programs, Spanish Programs for Spanish Teachers, and many other programs of instruction in the Spanish language. Our Spanish courses in Costa Rica are designed in cycles of one to the number of weeks you require; schedules may be adjusted to meet your own requirements. Where is Rancho de Español ? Rancho de Español is located in La Guácima de Alajuela, a small village 18 miles northwest of San José, capital of the country, and about 15 minutes away from the international airport, Juan Santamaría. How long are your programs? When can I start? Our Programs run from one week to the length of time you want, depending on your objective, schedules may be adjusted to meet your own requirements. The programs start every Monday of the week, all-year-round. Who typically attends Rancho de Español? From Families with Kids, teenagers to Retirees. The majority of the students are Kids, High School Students and Professionals (ages 19 to 55). We have 12 levels of Spanish: Beginning 1,2,3, 4 Intermediate 1,2,3,4 and Advanced 1,2,3, 4. Spanish classes are intentionally kept small (no more than six students per group), in order to give more attention to your needs and to create a better dynamic in the classroom. A student can receive one-on-one instruction if he or she desires. There is an extra cost if you choose this option. Does Rancho de Español have experience teaching advanced students? Rancho de Español in Costa Rica has been dedicated to teach Spanish as a foreign language for more than 20 years. Do I have the same professor every week? No, every two weeks students change professors in order to expose them to different expressions, vocabulary, accents and teaching styles. If you are planning to travel with your children, you are welcome to have them attend the school and learn the Spanish Language at the same time as you. We can accomodate you and your children in a host family with other children to enrich their immersion experience. Babysitting service during class time hours can also be arranged. What are the hostfamilies like? You will actually stay in their living quarters and can become a part of the family. Their homes are clean and ordinary. 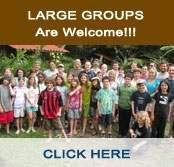 These are Costa Rican families who truly welcome you. They will do everything in their power to please you. Do I have all my Meals? Costa Rican food is delicious and there is always the smell of good cooking and coffee. This family cooks three meals a day that is if you are hungry. At first three meals might seem like a lot of food but around two days later when class is almost over you will be looking forward to those meals. Can families, spouses or travel companions stay in the same homestay? Rancho de Español does place students together upon request with no problem. If your family has more than 4 members we recommend to stay in one of the apartments on campus. Should I bring a gift for my family? If you would like to bring your family a gift, we recommend something that is particular to your area of the world (such as a mug with a picture of a famous landmark in your town). Other popular gifts have included kitchen items (tea towels, pot holders, etc. ), chocolates, and candy, things that are expensive or hard to find in our country are more than welcome too. Families do not expect gifts, so do not feel obligated to bring anything. How long may I stay in my homestay? From one week to the length of time you require. If you finish your Program and want to stay longer with your hostfamiy, you just need to request it ahead of time, because Rancho the Español may count on that family for another student. I am a vegetarian; can the family accommodate my needs? Yes, the host families are accustomed to cooking for vegetarian guests. Also the Costa Rican diet is very vegetarian. I am not interested in a homestay--what are my options? For your convenience and if you prefer more privacy, the school offers fully furnished, single, double and for families, apartments on the school campus with a swimming pool in the backyard, and surrounded by beautiful gardens. There you will be able to prepare your own meals, or if you still want to interact with a native family, we can arrange your three meals at our restaurant El Crisol. We definitely understand your concerns about traveling abroad. However, Costa Rica is a serene country that is committed to upholding its history of peace and diplomacy. The nation also depends greatly on tourism and treated with respect and kindness. However, travelers should always use their common sense and best judgment, especially when visiting major cities. Do I have Airport Transportation? Yes, you have Pick up and Drop off Transportation. Home-stay (included) or apartments on campus (extra cost).